Although I'm uncertain as to precisely how many writers it actually took to come up with what is – at its core, at least – an otherwise refreshingly clever, new and promising premise for a New York comedy, unfortunately because the individuals are all listed in the credits for See You in September , I can reveal that it took four people to destroy it completely. After Lindsay (Estella Warren), a commitment-phobic, neurotic New Yorker dumps yet another all-around good guy who musters up the courage to propose, she finally realizes that her long-suffering best friend Monica (Liza Lapira) is right in telling her that it's not the man's fault but her own. In other words, whereas "it's not you, it's me," is usually a polite line people say when they mean the opposite during a break-up, when it comes to Lindsay, the truth is that it's always her. And since it seems as though Monica has been playing this same tune to her like a broken record, it seems dubious that when this revelation finally occurs to Lindsay in the office of her therapist (Whoopi Goldberg) it's heralded as “a breakthrough." However, because the only person it seems that Lindsay is happily and willing committed to is her therapist, she doesn't take the news that they'll be spending some time apart lightly. Upon discovering that her Manhattan based shrink is leaving the city as part of the “mass exodus” of therapists in August, Lindsay decides to take action, venting her frustration in a lengthy spirited posting on craigslist.com wherein she proposes that her fellow co-dependent neurotics should all come together and support each other in their time of need. And while the craigslist call to action may have been inspired by the adventures of Jonathan Ames in Bored to Death wherein he used the site to advertise his services as a fake detective, the ridiculous yet optimistic September premise is still winningly original enough to keep us intrigued... at least for a little while. Determined not to turn the idea into a kooky convention, Lindsay somehow manages to convince poor Monica to let her host the mental meet-up at her loft. Having weeded down prospective candidates to a suitable number with a few alternates – like jury duty, as Monica jokes – Lindsay's idea for a hypothetical heal-a-thon is quickly set in motion. Obviously by this point, we've already had to push our cinematic suspension-of-disbelief into overdrive given the major gaps in plausibility, logistics, safety, privacy and practicality upon considering just how potentially dangerous and alarming this situation could be in real life. Nonetheless, because of the charm of Estella Warren (rather than her narcissistic, thinly drawn character) as well as the off chance that we'll be treated to a far funnier version of Nora Ephron's demented hotline gone haywire effort Mixed Nuts or some sort of hybrid of Cuckoo's Nest and You Can't Take It With You , we hope for the best. Unfortunately, our patience starts wearing incredibly thin once the future group members arrive. Soon we realize the irony in the decision to have them slap on a homemade name badge as once the caricatures -- er I mean characters -- begin to speak, we imagine that the writers had actually taken a name badge approach in their creation as well. Essentially the group feels comprised of stock supporting players invented after the writers randomly selected a personality trait or profession (e.g. comedian, documentary filmmaker, womanizer) followed by a a cliched “problem” that they will have to face – however tritely – over the course of the movie's incredibly episodic structure. Disappointingly, nothing comes together in a meaningful way in this stagy and lazy work that's chock full of recycled plot points borrowed and blended together from other movies including a “surprise” mugging wherein the characters are all held-up on their first night of group therapy, which worked much better the first time we saw it in Mike Nichols' Heartburn (incidentally written by Mixed Nuts helmer Nora Ephron). 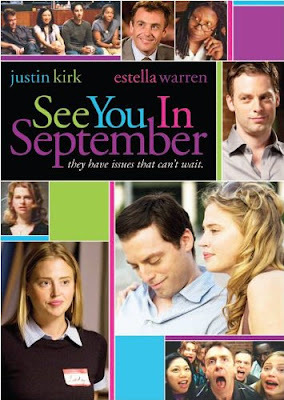 Likewise, it's further hampered by a lack of romantic chemistry between Warren and her leading man Justin Kirk whose unlikable character isn't exactly the stuff women dream of in rom-com escapist fare given his misogynistic views of women. And surprisingly, despite the introduction of their characters as a woman with commitment issues and a man with a fear of abandonment, there's relatively no dysfunction or drama in their relationship to speak of, let alone to keep us interested. Although there are some fun moments here and there, ultimately the film would've been better served by cutting down the cardboard excess of stereotypical therapy “types” to create characters truly worthy of our time as unlike Lindsay's idea that a dozen minds are better than one, when it comes to writing or telling a compelling story worthy of the creative premise, less is indeed more.